It is an appalling cliché, but of course a true one, to say that all good things must come to an end. And this, of course, includes IUCr conferences. After an intense programme of first-class science lasting a bit over a week, the 24th International Union of Crystallography congress ended on August 28 with the third plenary lecture. The topic for this final plenary, by Giacomo Chiari from the Getty Conservation Institute, Los Angeles, USA, illustrated the breadth as well as the depth of our subject: his title was ‘Crystallography in Art and Cultural Heritage’. Chiari began an engaging lecture by describing his feeling when he received the invitation to be one of the plenary speakers as “like you might feel when your data start proving your hypothesis”. He dedicated the talk to fellow Italian crystallographer Davide Viterbo, an emeritus professor at Universitá del Piemonte Orientale, Alessandria, Italy and a past president of the Italian Crystallographic Association, who died last May. 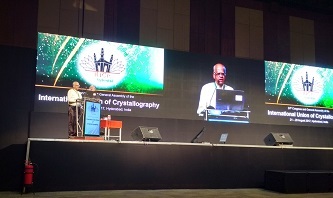 He then explained that crystallography and heritage overlap in two ways – in the depiction of crystals in artworks and in the use of crystallographic techniques to understand and preserve them – and that his lecture would be principally concerned with the second. But what is ‘cultural heritage’, anyway? One useful concise definition is “every material testament regarding [man] and [his] cultures”. The key word here is ‘material’; thus, Shakespeare’s plays themselves are not part of cultural heritage, although a First Folio – or any other physical copy – will be. And although it is not restricted to ‘high’ culture, objects must have significance. It is difficult to argue a case for preserving an ‘ordinary’ shopping-list, unless (for example) it is a list of pigments that Michelangelo gave to his servant. People who study contemporary culture frequently encounter the problem that some artefacts of genuine interest, such as film sets, were not designed to be preserved. 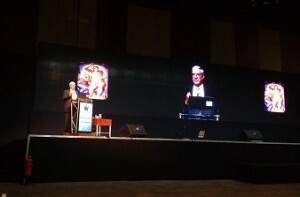 For most of the rest of his lecture, Chiari gave examples of how crystallographic techniques are used to study artefacts and the technology that had been used to make them. Some of the earliest of these were the polished ‘green stone’ axes that were developed in the Neolithic period and that were the first tools that were strong enough to cut down trees. Neutron diffraction has been used to analyse the surface textures of these axes and thence to try to deduce the technologies used to make them. Coming much closer to the present day, the first commercially successful photographs were images exposed onto light-sensitive silver plates, known as daguerreotypes. These were produced during the mid-19th century, with the oldest being the most valuable. In about 1860 the deposition process changed from cladding to electroplating; the latter process creates a micro-crystalline image with a preferred orientation, and this can be detected – and the daguerreotype dated to after 1860 – using a diffractometer. A similar process can be used to detect whether gilded medieval paintings were ‘touched up’ centuries later. Lapis lazuli is a deep blue metamorphic rock that was prized throughout antiquity for its colour. It was one of the most expensive of the pigments available to medieval artists and for some centuries later. X-ray diffraction can be used to identify subtle differences between batches of this and other early pigments, to detect layers of painting-over and sometimes even to distinguish between artists by the exact hues they used. In thanking Chiari for his fascinating lecture, conference chair Gautam Desiraju reflected on the interdisciplinary nature of the congress, with a programme designed to cross the ‘divide’ between structural chemists and structural biologists. This plenary, however, which had been organised by the relatively new IUCr Commission on Art and Cultural Heritage, had taken interdisciplinarity to a new level. He hoped that it had opened delegates’ eyes to a new aspect of their subject. Desiraju then led into the conference’s closing ceremony. He thanked all participants on behalf of the local organising committee for contributing to the meeting’s success, stressing, again, the number and diversity of delegates and presenters. The IUCr is flourishing and taking on new projects. There will now be a W.H. and W.L. Bragg Prize – awarded to crystallographers relatively early in their careers – to complement the Ewald Prize, and funds will be available for supporting crystallography and crystallographers in Africa, South-East Asia and Latin America. The newly-established Associates’ Programme now allows individuals to contribute directly to the Union and to have a real stake in its success. These initiatives will be overseen by a new executive committee with Sven Lidin becoming the new President and Marvin Hackert stepping aside – but not down – into the role of immediate Past President. And there is a significant change in the Union’s office in Chester, UK: the Hyderabad meeting marked the retirement of its inexhaustible Executive Secretary, Mike Dacombe. Lidin, Hackert and other members of the Executive Committee, joined Desiraju on the stage for one last, and very pleasant, duty: the award of no fewer than 26 poster prizes, far too many to be listed here. The judges must have had a very hard job to pick those winners from a field of about 700 largely excellent posters. The very end of the closing ceremony saw the handover of the baton to the next host city, Prague. The 25th IUCr Congress and General Assembly will be held there from August 22-30, 2020 and this blogger is greatly looking forward to being there. The Dragons’ Den competition for young crystallographers’ research ideas took place over two sessions, with two prizes awarded at the end of each one. The first session was reported on in depth on Day 4 of this blog. In the spirit of fairness, I now name the equally deserved winners of the second heat, held on Saturday 26th, here. They were both postdocs: the prize sponsored by Springer Nature went to G. Subramanian and the one donated by the meeting’s local organising committee to S. G. Ramesh.